It’s a pity that revealing the end of a film in a review is considered a spoiler. To me, a spoiler is that film which builds expectations and then dashes them to the ground. That sinking feeling I got while watching Thugs Of Hindostan and 2:0 is more than atoned for by Kedarnath, a film shot in the heartland of pilgrims where a cataclysmic flood devoured the entire topography, leaving in its wake a sense of irredeemable devastation. What if nature’s fury were to be unleashed when a pair of lovers are denied their right to be together? In Raj Kapoor’s Satyam Shivum Sunderam when a heart is broken Nature weeps howls wails in protest. I felt the same force of Nature here when the priest’s daughter Mukku is dragged out of her lovelorn state. As the girl hypnotized by love, Sara Ali Khan transports her character into a state of blissful hypnosis. She mumbles her beloved’s name (it’s, ahem, Mansoor) while her mother (Sonali Sachdev) tries to shake her out of her stupor. But Mukku would rather take a rain check…and I do mean rain, since it is the rains that announce the full ferocity of Nature when Man crosses limits. 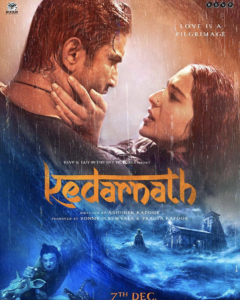 It is clear to all that the screenplay (Abhishek Kapoor, Kannika Dhillon) doesn’t intend to exploit the 2013 floods in Uttarkhand. Rather the catastrophe is woven organically into the plot. The narrative gifts it’s characters a space where matters of the heart coalesce with the politics of religion. This is not an easy mix to plough out of the heart-land. The director is in no hurry. Until the mid-point we see only a passion erupt between Mukku and Mansoor as they are thrown together in strange circumstances. Mukku’s single minded course of pursuing Mansoor would be called stalking in the MeToo context. But this film exudes such a scent of nostalgia it makes Mukku’s overtures look cute rather than criminal. By the time the town goes into a mass protest mode at the inter-religious love-match it is time for Nature to settle the score. Abhishek Kapoor films the water-inundated climax with a stunning disposition. As the rainwater swells soars and destroys property and man we are made witness to an inexplicable catastrophe. There is a curious subplot about this wheeler-dealer (played effectively by Nishant Dahiya) who infiltrates a pundit Nitish Bhardwaj’s home, promises to marry the elder daughter (Pooja Gor, effectively spiteful in her sisterly rage ) changes his mind and wants to marry the younger daughter instead. What a scamster this character is. The narrative sacrcely allows us to be judgemental. It has much on its mind. Not all of it is realized. The flood scenes are not shot with the same finesse that we see in the rest of the film. If the CGs do not match the authenticity of a Marvel movie it is okay by us. Kedarnath doesn’t try to impress us with technique. It is all heart. The lead players are not abashed about wearing their hearts on their sleeve. Sara Ali Khan is easily the discovery of the year. She embraces the camera with the familiarity that her mother actress Amrita Singh flaunted in her heydays. Saira’s character is as un-coy (to coin a word) about exhibiting her heart’s content as Amrita Singh in Mard or Chameli Ki Shaadi. Sara is a natural while Sushant Singh Rajput’s character is so naturally noble it’s tough not to like him. The actor gives his all to his role, and then some more, leaving no room for his Mansoor to be judged for his religious beliefs. Thankfully Mansoor is never shown doing Namaaz. He behaves “normally” while the city’s Hindu radicals get all worked up into a state of whiplashing lividity , much in the same way that they did in the director’s Kai Po Che. There are some moments of greatness peeking out of the storytelling , like the sequence where Mansoor tells Mukku how his father once wrote a fan letter to the great Lata Mangeshkar telling her how the Valley resonated to her voice when she sang. Mansoor then sings ‘Lag ja gale se’ for Mukku. Time stands still. Sushant brings a certain magic to this moment. At the end when Mukku sits to hear the radio, the same song is announced. But the song never plays. That unfinished moment of parting best defines the film’s theme of unfinished love. Have you ever seen a great love story that doesn’t end in tragedy? 16 queries in 0.620 seconds.